What a treat: the Cole Valley Fair. (Community) – What a treat for being alone on a Sunday! 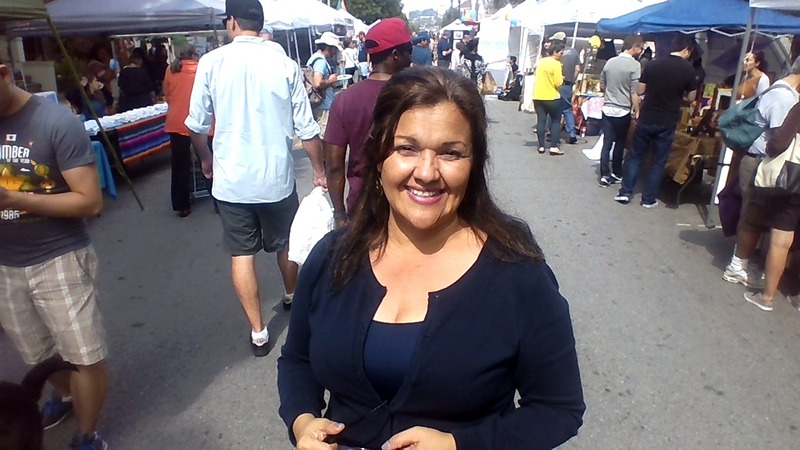 The Cole Valley Fair is a neighborhood gathering full of local art, crafts, photographs, delicious food, live music, live performances by young artists, and community organizations sharing information. It is family focused, but adults feel equally welcomed. A few blocks are closed to traffic and open to people on Cole Street, where the fair is located. I was there volunteering for SF Environment, and it amazed me how composting, recycling, and re-using savvy most adults and children in the city are. I learned that it is better to take left-over medicines and pills back to the pharmacy instead of trashing them and that batteries need to be put on a bag and left on the side of the garbage can. Good to know! It was great to see my friends from Sabor, a Guatemalan food truck and mobile restaurant, by the son and daughter from Restaurant San Miguel. Not far from there, neighbors showed off their vintage cars, and visitors loved looking at them! A few local residents said they had to come to the fair first, then go to the Folsom Fair. (Like the way we first go to church on Sunday, then on to other activities.) I thought those comments were very cute. Cole Valley Fair happens every September in this quaint, cute, and adorable Cole Valley in San Francisco, California. Next Blood Moon And Eclipse Seen From The San Francisco Bay Area.